In a world teeming with digital advertisements on every corner and in the palm of your hand, it’s tough to know who’s on whose team and why you should care. Sponsored content — or products of the relationship between a brand and a publisher — isn’t always designed to mislead. In fact, it’s actually a way for brands to reach people in more relatable ways. The trick is to make sure you’re informed but not persuaded without good reason. It’s partly human nature to be deterred by aggressive, abrupt marketing tactics — most people today want to know why a product works without having to weed through unsubstantiated jargon. Native advertising — the parent term for paid media that blends with their surroundings or host site — is often referred to as a softer approach to reaching an audience than traditional advertising, while also intending to drive more credibility. For reference, nearly 72% of consumers report having “lower opinions” of a brand if they see pop-up ads, and four out of five people will simply leave a page if they see a pop-up ad. Good content and subtlety lie at the heart of native advertising and its success. 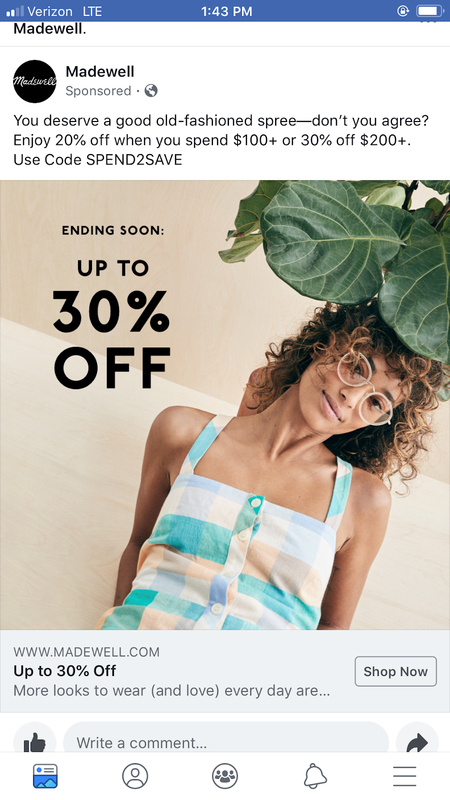 This Madewell advertisement is a native ad, but it doesn’t fall under the definition of sponsored content. Courtesy of Facebook. A recent eMarketer report predicts that by the end of 2020, U.S. advertisers will be pouring two-thirds of display budgets into native ads. Where does most of this money currently go? Facebook. The report indicates that mobile, in-app advertising drives the majority of brands’ native advertising budgets, so there’s a reason why you can’t scroll through your feed without seeing an ad or sponsored article for something you’re likely interested in. It also probably comes as no surprise that mobile ads account for the vast majority of Facebook’s business. Sponsored content, not to be totally conflated with native advertising, dives a little deeper and specifically encompasses articles, listicles, or videos created by a publisher (host) for a certain brand. Designed to hold your attention for longer than a quick social media post, banner ad, or pop-up, sponsored content brings actual value to readers by telling a story. Even though both content types appear in the same place and look similar, to fully maintain credibility on both sides of the coin, it’s safe to assume that you won’t see journalists writing for news and sponsored content. 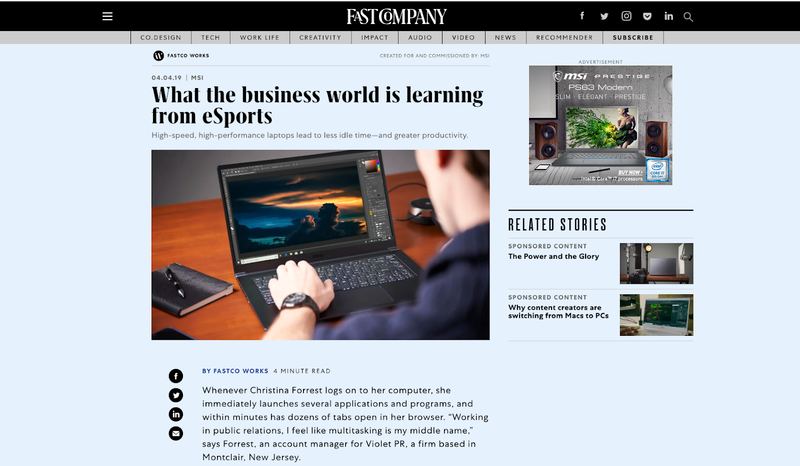 FastCo Works — Fast Company’s brand studio — boasts a prime example of clearly labeled sponsored content. You can tell that the page was paid for at the very top, but you’ll also see a brief description in a footnote covering who worked on the article and why: “FastCo Works is Fast Company’s branded consumer studio. Advertisers commission us to consult on projects, as well as to create content and video on their behalf.” This separates Fast Company as a publication from the brand partners that FastCo Works collaborates with on sponsored pieces. You may also hear the terms “branded content,” “content marketing,” and “advertorial” content thrown around in relation to sponsored content. But the definitions are nuanced; sponsored content is produced by journalists on their own platform in collaboration with a brand, while branded content generally refers to a brand creating engaging content for itself. Creators include celebrities, influencers or public figures that post branded content. Publishers include media companies and entities that post branded content. Business partners include brands, advertisers, marketers, or sponsors that sponsor branded content. Advertorials, on the other hand, encompass newspaper or website content that looks and reads like a publication’s content but is paid for by the brand it’s representing. So, what’s the difference between an advertorial and sponsored content? Advertorials tend to reveal the brand’s bias in a similar fashion to traditional advertisements. You’ll often find a sales pitch or two within an advertorial — whereas sponsored content doesn’t overtly promote the brand it’s representing. There’s a reason why marketing in storytelling form has been around since the beginning of the 20th century. Not only do people tend to pay more attention and feel as though the content isn’t forcing them into buying something, they also actually remember more about brands after engaging with branded content. A 2016 Nielsen study showed that branded content generated 86% recall in the brand’s detail compared to 65% recall from pre-roll ads (or promotional videos). The study also showed how marketers that partnered with publishers saw a 50% higher brand lift than those that opted to publish content on their own. Why? Because publishers typically have the skills and tools that some brands may lack — like writing styles, personalities, and, of course, audiences. As for the most effective brand partnerships — it’s safe to say that if you’ve ever felt or thought about something differently while reading or engaging with a piece of branded content, your brain will probably form positive associations around it. You might even be one step closer to writing a check. That’s why it’s important for consumers to be able to make distinctions between the two players at hand. Why Should You Care About Sponsored Content? According to the Federal Trade Commission’s (FTC) guidelines for native advertising, sponsored content shouldn’t leave you guessing. Meaning, you shouldn’t have to ask yourself: “Who paid whom to write or share this, and how did that color the outcome of this content?” At its very core, sponsored content has motives other than simply to inform you. This type of advertising poses an opportunity to make the sponsor look more trustworthy while sheathed in another publication’s clothing, but it treads a fine line between bringing out the brand’s honest message and intentionally casting the brand into something that it’s not. By default, the brand somewhat absorbs the publisher’s reputation and vice versa. That’s why relationships between publishers and brands are delicate and carefully curated, to an extent — some advertising partnerships pose the risk of undermining editorial integrity. The ultimate goal is that brands will “rise to the level of quality that their host publication has set, editorially, in order to be valued by readers in the same way,” Melanie Deziel, content strategist and founder of StoryFuel, said in a Q&A with the Native Advertising Institute. Deziel said in the interview that most people naturally approach brands with a “fair level of skepticism,” thus making it even more important for brands to uphold high standards of integrity. In response to confusing endorsement relationships, the FTC also sent over 90 letters to Instagram influencers and their sponsors, reminding them of the importance of disclosing their relationships “clearly and conspicuously” within the posts. Although they embody completely different advertising methods, Instagram endorsements and sponsored content both pose the risk of consumer deception. 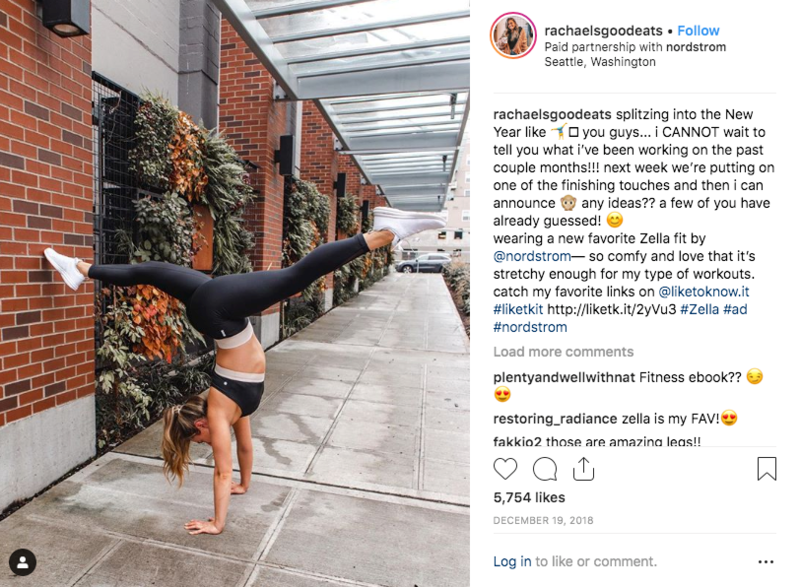 Without having “Paid partnership with nordstrom” stated clearly below the handle and #ad in the body of the Instagram post below, it might be fair to assume that Rachael Devaux, registered dietician and personal trainer, simply enjoys Nordstrom’s athletic gear and wasn’t paid to be enthusiastic about it. On the flipside, it would also be natural to assume that someone wouldn’t partner with a brand they really didn’t believe in. Not all sponsored content is deceptive and dripping with biased, skewed information, just like not all journalism is pure and reflects every intricate side of an issue. You can, and should, however, be able to tell the difference between the two in order to avoid being deceived.